This assumes so many facts not in evidence that it almost doesn’t deserve a response. I would start with the assumption the dominate use of guns is criminal and leave the rest as an exercise for the reader. 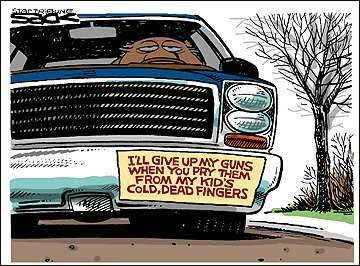 This entry was posted in Gun Cartoon, Gun Rights by Joe. Bookmark the permalink. I will swear on a stack of bibles, Talmuds, Korans, and Principles Of Personal Defense that I never keyed this car. I won’t swear that I never thought of it…. Oh for Further Irony, Belmont PD had told me I could only be trusted with a “Target and Hunting” permit because “That’s what the chief says”.